Jojo Moyes has become of the "it" authors nowadays, yet this is the first of her novels I've read. I say this because, whenever I mention to anyone that I'm reading this, they ask how it stacks up to Me Before You--and I just don't know. The premise of The Ship of Brides was interesting to me, but I will say that it isn't unique. I've read several "war bride" novels and I usually enjoy them. This was no exception. This is one of the better war bride novels I've come across. 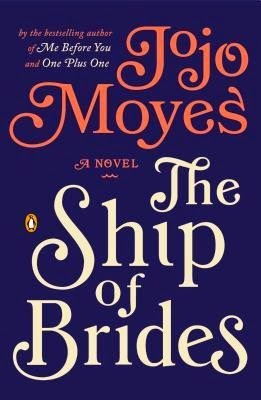 Moyes has an inviting voice and paces her novel quite well--just when you think you might have a chance to put it down, she draws you right back in. It wasn't a perfect book--the plot was a bit predictable, but that may be because I've read so many War Bride novels and there is only so much variation one can realistic do with that framework. Margaret and Frances were great characters, but I felt that Avice was more one-dimensional and I felt that Moyes didn't fully finish her story line. Still, it was an enjoyable book and something I would recommend to someone wanting something a little heavier than chick lit, but lighter than some other historical fiction.